Association management platform provider, Socious, attributes inclusion in the 2016 list of top companies to work for in Arizona to a strong culture, consistent revenue growth, and products and services that make a significant difference in the lives and jobs of their customers. This distinction is a special honor because we try to be an employees-first company at every level. Socious, a leading provider of membership management and online community software, was named one of the Top Companies to Work for in Arizona by The Arizona Republic, the state’s largest newspaper. The 2016 azcentral.com Top Companies to Work for in Arizona distinction was awarded based on the results of a 78-question internal employee engagement and satisfaction survey. The newspaper also pointed out Socious’s tuition reimbursement for grades of B or better on approved courses. “This distinction is a special honor because we try to be an employees-first company at every level. It is our employees that make this company stand out to our industries and our customers. And it is our employees that put Socious on this list of top companies to work for in Arizona,” said Paul Schneider, CEO and co-founder of Socious. Socious, which recently unveiled its MemberCloud platform, provides membership management and community software to some of the world’s top associations, companies, and technology user groups. Organizations leverage Socious’s software and professional services to manage relationships with over 1.6 million customers. For the past 6 years, Socious averaged 24% revenue growth per year. Socious recently doubled the size of its headquarters office in Mesa, AZ and is currently hiring for several positions in the sales, support, and community management departments. 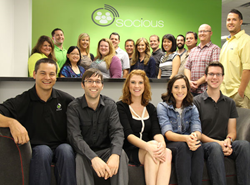 Follow Socious on Facebook, LinkedIn, or Twitter to learn about open positions. Career opportunities at Socious are listed at socious.com/jobs. Founded in 2002, Socious (socious.com) offers software and services to help associations and user communities take a members-first approach to growing and engaging their membership. Socious's MemberCloud platform manages over 1.5 million members for many of the world's top associations and companies. Socious provides a full range of professional services to help organizations manage their membership, grow their community, and plan events.